Nobody on the Walter Johnson girls’ team has ever known a world in which they haven’t been defending state champions. That will continue for another year, after the Wildcats won their record fifth straight 4A title. Through nearly three miles, a pack of nine boys stuck together, fighting for the lead in Montgomery County Championship. 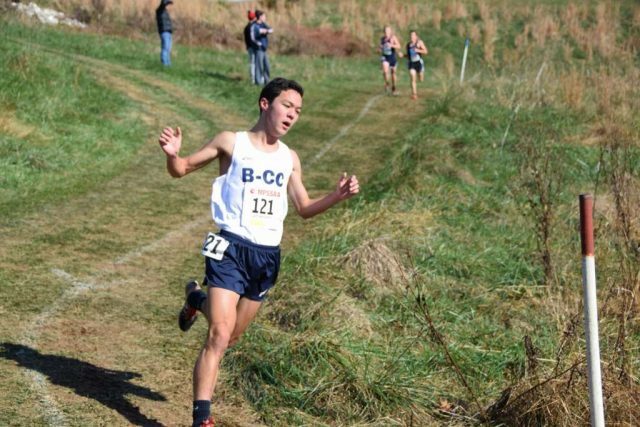 With a misstep in last year’s race still fresh in his mind, Bethesda-Chevy Chase’s Adam Nakasaka upset the careful detente among the guys who had traded off the lead for much longer than almost anyone had expected. Abbey Green came up just short in her latest attempt to win a Maryland state cross country title, a rematch with Annapolis senior and 2015 Footlocker finalist Maria Coffin. Yet in the end, the Walter Johnson junior said she could not have scripted the race much more perfectly. In the state 4A race at legendary Hereford — a three-mile cross country venue so tough, they say, even Centro couldn’t break 16 minutes — Green and Coffin left 152 other harriers far behind in becoming the first two girls to cover the course in less than 18 minutes. Even as Coffin broke free of Green in the final mile, maintaining a small lead up the race’s final hill, Green’s stride was still strong. It looked for a second like she might even rally. And after crossing the line in 17:54, five seconds back of Coffin, her repeat runner-up complete, Green took some time to catch her breath before walking back towards the finish – again, like last year, waiting eagerly for her teammates to join her. Katrione Kirsch was the first to come through, placing 7th in 19:38. Then came Sadie Keller, Janet Scott, and Sophia Scobell, all finishing in the top 25 positions as Walter Johnson claimed its fourth 4A title in a row. Winston Churchill Senior Julia Reicin led the chase, finishing 3rd in 19:06. Paint Branch junior Yasmine Kass was 9th in 19:43; Northwest had the top freshman in Helena Lee, who was 12th in 19:54. Meanwhile, sophomore Jessica Trzeciak, in 6th, led T.S. 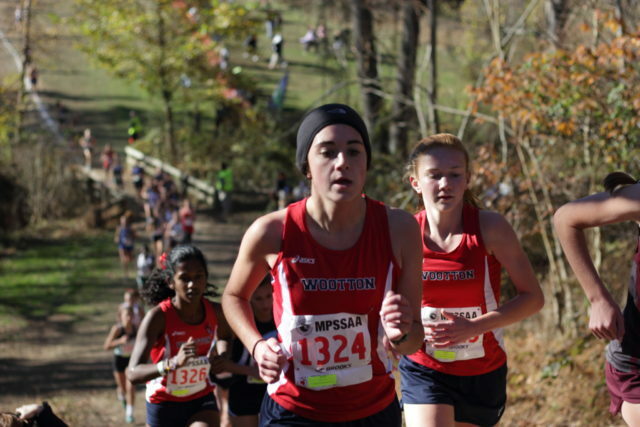 Wootton to a runner-up finish, the team’s highest ever, said coach Kellie Redmond. Heading into today’s championships, Sophomore Madeline Grainger was the team’s only athlete who had ever even run at Hereford. She had qualified last year as an individual as injuries ravaged her teammates. In the 3A race, Nandini Satsangi paced Poolesville to a fifth place showing. It wasn’t the result that the team was hoping for, or the result that Sandini, who had the fastest seed and finished 9th, would have envisioned after winning her regional meet by nearly a minute. No one, however, should think Satsangi had an off day. Rather, it was a gutsy effort. The Friday after regionals, Nandini irritated a tendon in her foot, she said. She did not run at all between then and the state meet and wasn’t sure if she would be able to complete today’s race. She never doubted, on the other hand, that she would try. Nandini, as it turns out, was going to have to spend some time in the pool, anyway. Her next season isn’t indoor track; it’s swimming. Hereford’s rarely broken 16-minute mark went down in the 1A race when Smithsburg senior Will Merritt ran 15:54. But 4A champion Rohann Asfaw (16:04) and 3A winner Ryan Lockett (16:00) were close. 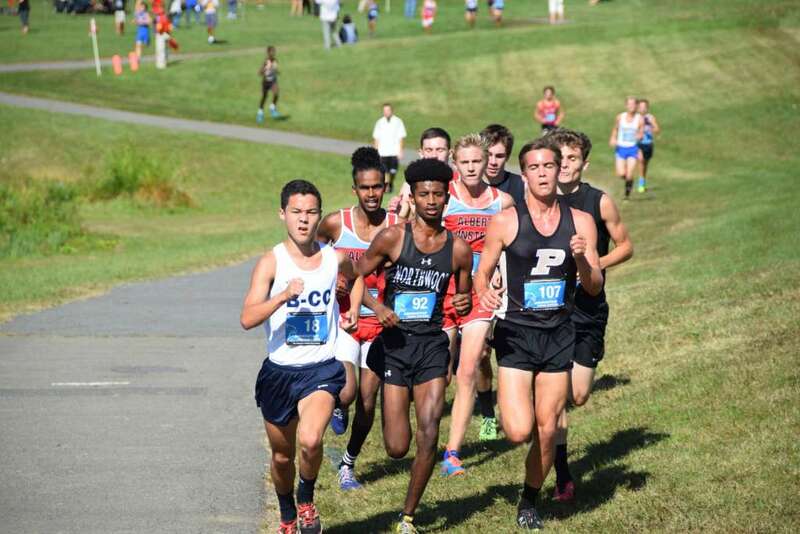 Lockett, a Poolesville junior, was runner-up to Richard Montgomery senior Asfaw at the Montgomery County meet. In winning a state title, Lockett demonstrated some playful swagger, celebrating in his final steps by taking his left hand and pointing at his right forearm like NBA star D’Angelo Russell – “ice in my veins,” said Lockett, who coincidentally also wore long shorts. “Honestly, I knew that I could outkick anyone at the end, so I was pushing the pace,” said Lockett, who ran neck and neck with River Hill Senior Rahul Reddy into the final straight (Reddy finished two seconds back). Lockett was joined in the lead pack by senior teammate Andrew Lent, whose 4th place 16:12 was a considerable improvement over his first appearance at the state meet when he finished just inside the top 100. Poolesville finished 4th behind River Hill, Linganore, and Reservoir. Lent said his senior-year training was jumpstarted by Lockett’s transfer to Poolesville from Gonzaga. They developed a pattern of keying off each other in races, as well. “I would come up to [Lockett]; he would see me coming and go a little faster,” Lent said. Asfaw’s victory, though slower, was more decisive. He got out slow in the 4A race, too slow by his own standards. Even Richard Montgomery’s coach, Davy Rogers, was a little concerned initially, he said. But when he saw Asfaw coming back in the baseball field towards the famous dip, Rogers saw what he needed to be sure that Asfaw was in control: his arms were relaxed. By the final stretch, the race was all Asfaw’s. This was even an more impressive time when considering that Asfaw is not yet tapering. He’s chasing a dream to compete at Nike Cross Nationals in December. Dulaney repeated as boy’s 4A champions and Northwest placed 5th, led by Junior Chase Osborne‘s 24th-place finish in 16:59. Albert Einstein junior Simeon Mussie cracked the top 10, finishing 8th in 16:42. And Bethesda Chevy-Chase junior Adam Nakasaka, mirroring his Montgomery County meet strategy, hung with Asfaw as long as he could and hung on for 2nd in 16:12. His team was sixth. At mile two, when the pace slackened, Nakasaka even pressed forward into the lead en route to running nearly 40 seconds faster than he had as a sophomore.